Labels are a handy way of categorising elements within adwords. Google have had labels at an MCC level for some time, they have recently updated this to allow labelling of Campaigns, Adgroups, Keywords and Ads. This is really good news as it means it is fairly easy to set up customised reports at any of these levels. With labels, you can organize the elements in your account into meaningful groups so you can quickly and easily filter and report on the data that is of most interest to you. 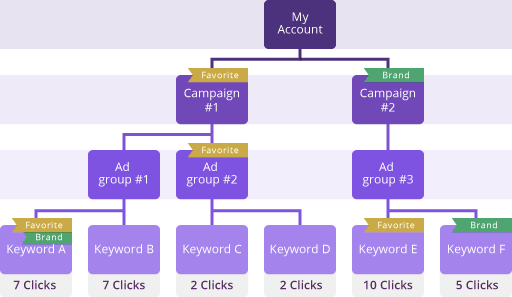 You can apply labels to keywords, campaigns, ad groups, and ads, which enables you to see how the custom categories you create are performing relative to each other and to the unlabeled entities in your account. Google has a good set of reports that allow for reporting at some very Granular levels, there are of course some limits, such as how are my remarketing campaigns doing compared to Youtube? Labels will be a way to break through some of these limitations. Previously it would require manually extracting the data for these campaigns and then aggregating the data before analysing it (or looking at hundreds of adgroups and trying to take an informed opinion). Labels do the work of aggregating the data for you, in the adwords interface under the dimensions tab. Sorry Excel. Another use would be labelling Ad messages, how did the 50% off message do against the Best price across all adgroups. Labelling ads across the account makes top level analysis of each message considerably easier (but does take time to set up… nothing in life is free). I have started using labels in larger accounts, where there are multiple Display channels such as Youtube or Remarketing. I am looking forward to rolling this out to other accounts and spend a little less time in excel. 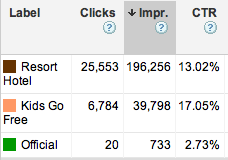 I think this is a very useful addition to the adwords reporting capabilities. Set-up is very easy but does take time. I am looking to find out if there is a limit on the number of labels so will update when I find out.